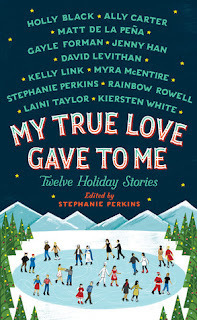 This is a collection of short stories, mostly Christmas themed, and all with a bit of romance, written by some of the most popular authors who write for teens. Out of the twelve authors in the collection, I've read books by six and have heard great things about four others, leaving only two authors I hadn't heard of before. What a treat! These stories run the gamut from realistic fiction to fantasy, with many somewhere in between. One of the new-to-me authors I was excited about was Kelly Link and her story "The Lady and the Fox" did not disappoint. Miranda's mother is in prison in Thailand so Miranda spends every Christmas with her godparents, the Honeywells. Every time it snows on Christmas a mysterious man appears outside the house and Miranda is determined to find out who he is. Matt de la Peña, another author I'd heard of but never read, wrote one called "Angels in the Snow," which I think was one of my favorites in the collection. A young guy is housesitting over his college Christmas break because he can't afford to go home, but he also can't afford to eat. He befriends a young woman in the building but tries to hide his hunger from her. "The Girl Who Woke the Dreamer" by Laini Taylor was a fantasy, fairy-tale like and totally beautiful and kind of weirdish in a really good way. She's the author of the Daughter of Smoke and Bone series, which has just jumped up a few notches on my imaginary TBR list. Those were all on the more serious side of the collection, comparatively. "Welcome to Christmas, CA" by Kiersten White (who I hadn't heard of before) takes place in a diner when a new, magical, and definitely good-looking cook is hired. The food bits were super fun, although there was a fairly serious subplot, and a pretty touching story about Maria's family. Another great one was "Star of Bethlehem" by Ally Carter in which a teenage girl impulsively trades plane tickets with a similar-looking girl from Sweden who wants to fly to New York instead of going to Oklahoma to visit her long-distance boyfriend. For reasons we learn later, our protagonist is trying to escape her life and although she knows her scheme is not going to work she's willing to try. So she goes to Oklahoma and meets the Swedish girl's boyfriend and his family. So far, all these great stories I've mentioned were by authors I hadn't even read before. But there are also authors in this collection that I already knew I liked! "Polaris is Where You'll Find Me" by Jenny Han is about a human living among elves at the North Pole and doesn't quite fit in. It sounds like the movie Elf, but it's totally not. (Although I also love Elf.) It was fun and light and festive. "It's a Yuletide Miracle, Charlie Brown" by editor Stephanie Perkins is about a somewhat-accidental acquisition of a Christmas tree by a teenage girl, and the boy who helps her bring it to her apartment that doesn't actually have room for it. Rainbow Rowell's "Midnights" began the collection with a romance that takes place on several New Year's Eves and, like her books, it's hard to describe why it is so wonderful. If you just like fantasy or just like realistic fiction you'd have to pick and choose from this collection, which I recommend if you recognize the authors from your most-loved genres. But if - like me - you read in various genres you'll probably enjoy the whole thing as much as I did.